Simply pull this out and teach each day, then close it up and put it away when you're done. No shuffling papers or hunting for next week's schedule! A large 3" spine with plenty of room for your History / Bible / Literature IG and a Language Arts IG, Science IG and more. Three locking D-rings that keep all your papers neatly in place (even if you accidentally drop the binder). 36 sturdy tabs to organize each week's schedule and notes, plus extra tabs for the IG's other sections. An inside pocket to store post-it flags to mark your place, student papers ready to review, or miscellaneous homeschool papers that need a home. Want to save time? Consider purchasing Instructor's Guide Assembly and we'll load your IGs into your binder for you! This is a great way to make starting your year a smooth experience. 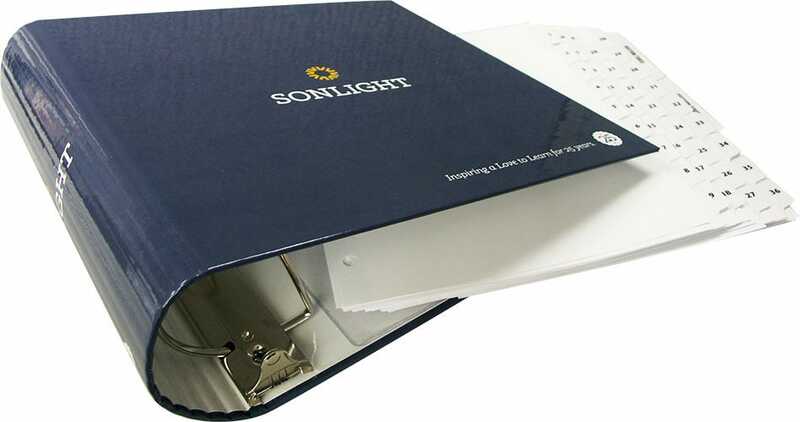 You can use the whole binder every day, or use it like a school filing cabinet with everything organized and easy to find. Simply remove a couple weeks' worth of materials and put it in a working binder. When you're done, put the papers back in the "filing cabinet" and take out 2-3 more weeks. For levels 100-500, you will need two binders—one for both you and your student. The Binder and Tabs can each be purchased separately.